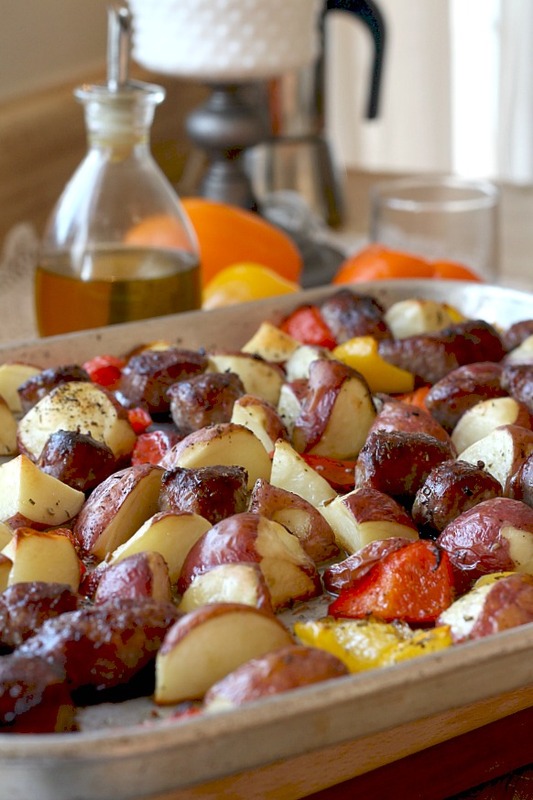 Are you in the mood for a hearty meat-and-potatoes kind of meal during these cold, wintry days? 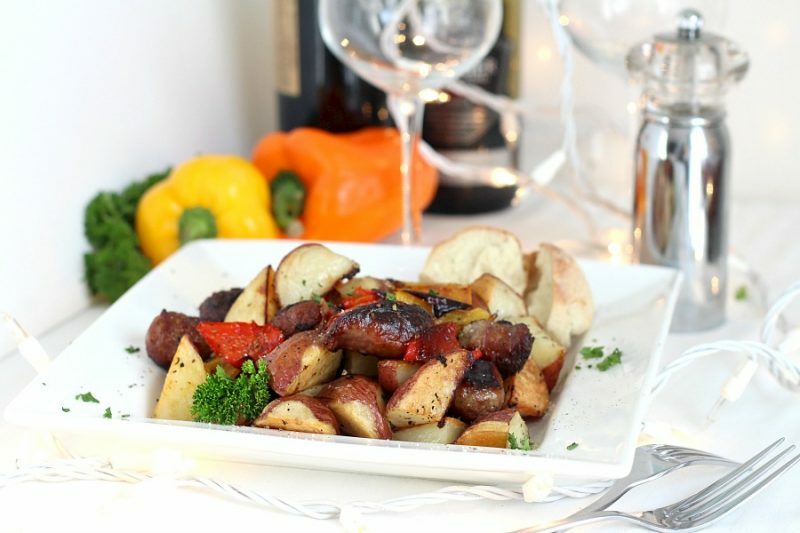 Roasted German brats, potatoes and peppers is that kind of meal. Super easy to make too. Just toss the vegetables with olive oil and add the German brats. Season as desired and roast until everything is browned and crispy. 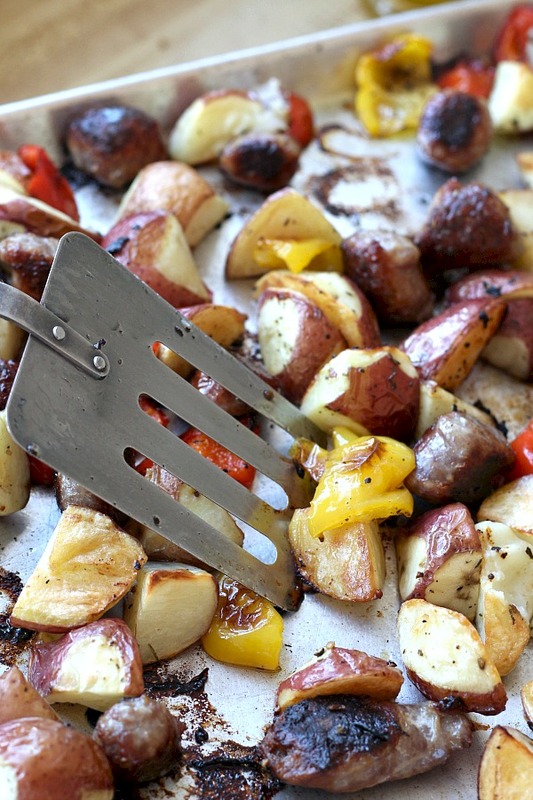 It is a delicious, whole meal in one pan. 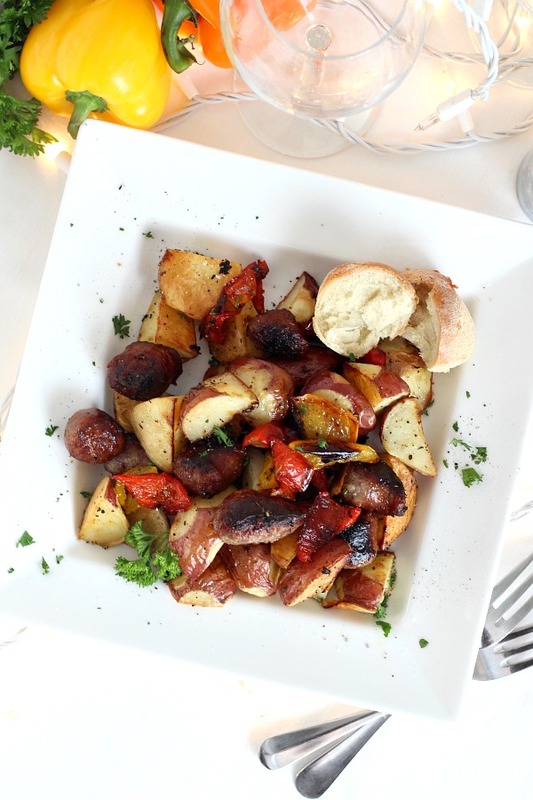 A plate full of beautifully browned sausage and deliciously roasted potatoes and vegetables is sure to satisfy even the heartiest appetites. 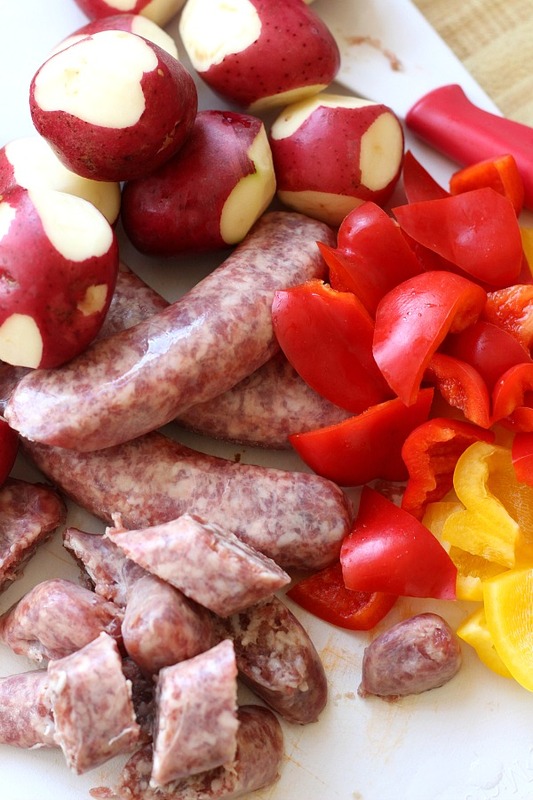 Begin by washing and cutting the potatoes, peppers and brats. I love to add chopped onion but when I looked in the pantry, I discovered the onion bin empty. Do add them though when you make this dish. Also, if you love sweet potatoes, like I do, you can substitute them for white potatoes or use both. 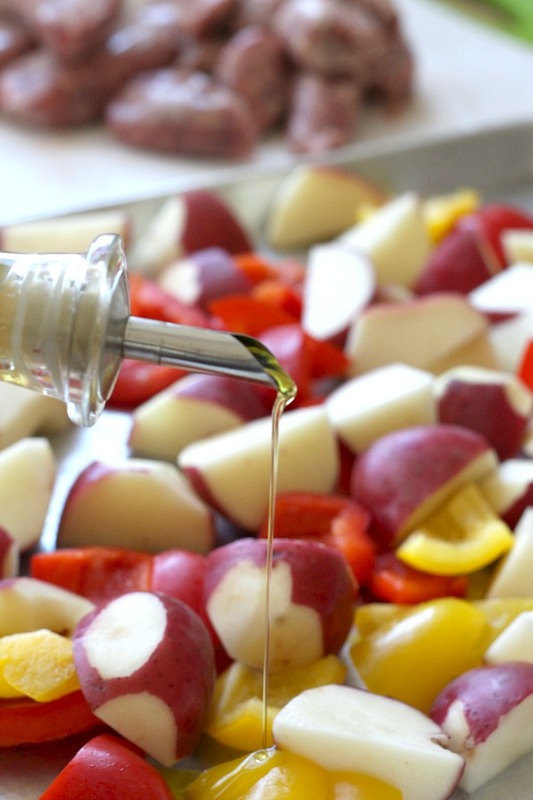 Place the veggies into a heavy duty baking pan; pour on olive oil and toss to coat. Season with salt, pepper and any other herbs you like. Add the slices of German brats and make sure everything is in one layer so it all browns nicely. Use two pans if you need because browning happens best when the pan is not crowded. Give a stir once or twice during roasting allowing all sides to get that great browning. All done and ready to serve. Add additional salt and pepper, if needed, and enjoy! On a large heavy duty sheet pan, add the vegetables; Drizzle with olive oil and season with salt, pepper and any herbs you might desire. Toss well making sure everything is coated well. Toss in the brats. Spread the vegetables and German brats in a single layer in one or more large shallow roasting pans; do not crowd them or they will not brown. Roast in preheated oven, stirring once or twice, for 45 – 50 minutes or until potatoes are tender, browned and crispy. I have all these ingred. minus the potatoes. It is windy/cold here this weekend and this will taste great! This recipe sounds delicious! =) I need to try it soon! This is one I have to try. I think I can almost smell it roasting now! Boy, does this look delicious! I love brats and this is the perfect combo. One pan meals are the best! 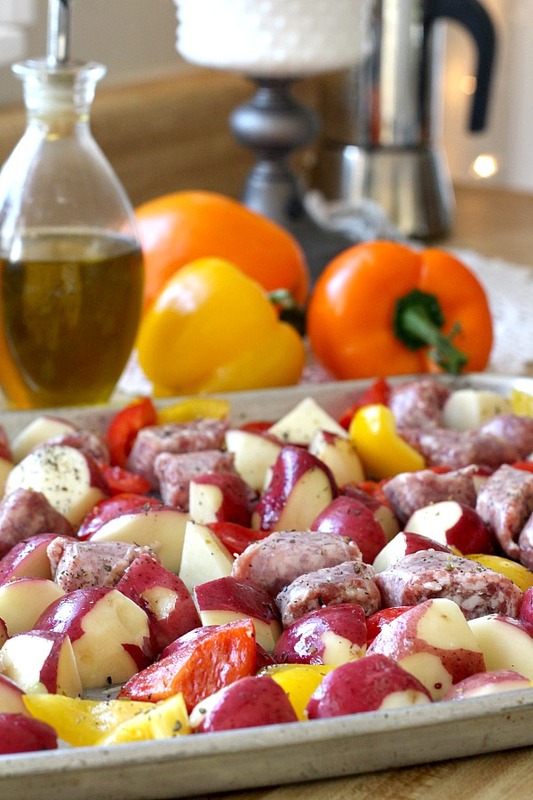 I love one-pan meals and this one looks delicious! Putting this on my menu plan for next week . . .